A good-sized crowd gathered at the Sugar House in the heart of the Hartje Outdoor Learning Center to celebrate the beginning of Maple Syrup month in Wisconsin on March 16. Theresa Baroun, representing the Wisconsin Maple Syrup Producers Association and Justin Baroun, Maple Marketing Intern welcomed attendees. Matt Peetz, Elementary Associate Principal, and Jerry Griffin, volunteer, spoke about the maple syrup education program the district's fourth-grade students participate in and the history of the Hartje Outdoor Learning Center's Sugarbush. 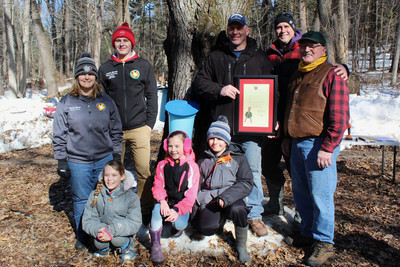 Clint Beyer, Pineview Elementary Principal, read the proclamation from Governor Tony Evers and three fourth-grade students from Pineview Elementary School tapped a tree to signify the official beginning of maple syrup month. Attendees enjoyed a nice walk in the woods exploring the Hartje trails and seeing the almost 200 trees that the fourth-grade students tapped this week. Inside the Sugar House, the evaporator was undergoing a test run and steam was flowing from the evaporator. Lastly, everyone enjoyed some delicious maple flavored treats including fresh filtered maple tree juice, coffee made with maple sap instead of water, and everyone's favorite maple candy! Thanks to the many volunteers that made this day a success! Each year the voices of fourth-graders from Pineview Elementary School excitedly flood the Hartje Outdoor Learning Center, a 128-acre piece of wooded property owned by the School District of Reedsburg, ready to tap trees and collect sap from maple trees. Fourth-graders have been coming out to the school’s outdoor learning center to collect tree sap since 2016. The sap collection project has been part of their study of Wisconsin history and has allowed for a unique hands-on learning experience that connects nature to many aspects of their curriculum, including math, science, and writing. According to Associate Elementary Principal Matt Peetz, in the project’s earlier years, the sap collected by the students was boiled down using a flat pan method, but thanks to a generous donation from the Throndsen family, the district now has a more modern evaporator from Vermont that can process 40 to 50 gallons of sap an hour. The Pineview PTO also donated funds to build the sugar house, enhancing an already successful educational project for students in the years to come. Now the fourth-graders in the district start visiting the sugar bush in late-February to learn how to tap the maple trees and start the sap collection process. The students also use a refractometer to measure the sugar content in the sap. Different trees can have different percentages of sugar, so the hunt is on each year to find the sweetest maple tree in the forest. Last year the sugar content was running rather high — about 4 percent — which is pretty good. Maple trees, on average, produce sap in the 2 percent to 3 percent range. Three different methods of tapping were used on the trees in the forest during 2018. In total, about 200 trees are tapped each year at the Hartje Center. Sixty-two trees that are in close proximity to each other, and the sugar house, were put on a line system, where the sap flows through lines into the bulk tank attached to the sugar house. Buckets were installed on about 50 trees and the remainder had bags installed on them to capture the sap. About 70 of the trees that have been tapped are red maples, while others are sugar maples. The trees have been marked with either a red leaf stamp, signifying a red maple, or a yellow leaf stamp, signifying a sugar maple, so the students can compare and make observations about the sap collected from each type of tree. Students visited the forest three times last year. In addition for the first time in the history of the project, there was enough maple syrup made so students could buy a pint of it if they wanted. Funds raised through the sales go back into the project. The project has had good community support, with volunteers like Jerry Griffin, Bill Klang, and Don Leatherberry heading out into the woods regularly to check on the buckets and make the maple syrup. Dana Westedt, a retired fourth-grade teacher for the district, prepares tasty treats with some of the syrup and shares recipes students can make at home. Parents of fourth-graders have also been invited to come out with their children to see what the project is all about, and they, too, seem to have learned a bit about the process themselves.